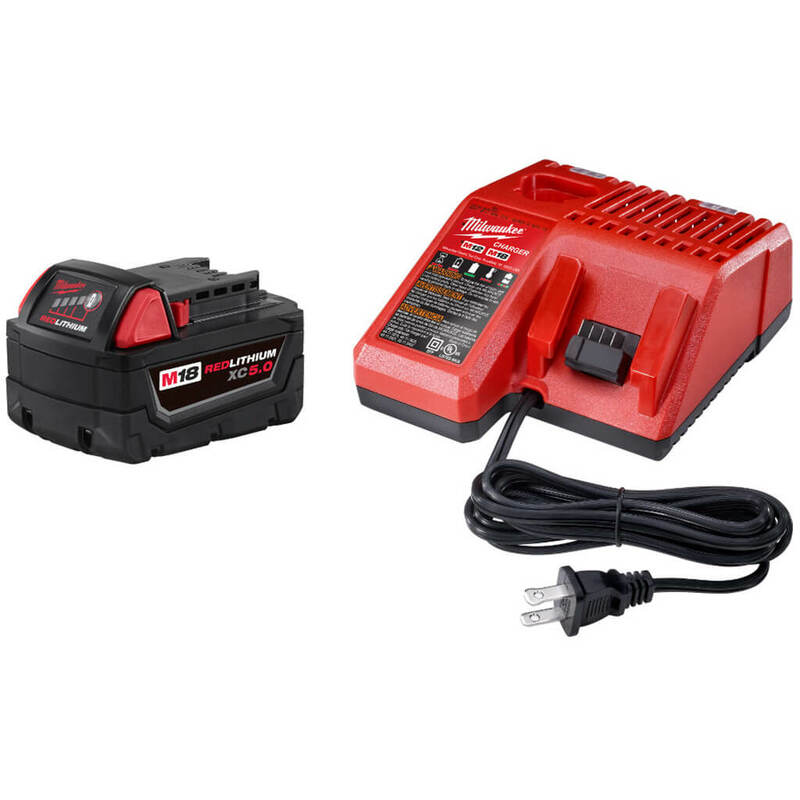 Milwaukee 48-59-1850 M18 18-Volt 5.0 Ah Lithium-Ion Battery and Charger Starter Kit delivers up to 2.5X more run-time, 20% more power and 2X more life than standard lithium-ion batteries. The M18 REDLITHIUM XC 5.0 Extended Capacity Battery Pack features superior pack construction, electronics, and performance to deliver more work per charge and more work over the life of the pack than any battery on the market. The M18 REDLITHIUM XC 5.0 Battery features an advanced design, protecting the pack against harsh jobsite environments. This protection routes water away from the electronics and out of the battery pack, extends run-time and life by minimizing heat, and prevents pack failures from vibration or drops. This unique to Milwaukee design also allows the battery to operate in extreme cold weather conditions (below OoF/-18oC). Managed by Milwaukee's exclusive REDLINK Intelligence, the battery features overload protection to prevent you from damaging your cordless power tools in heavy-duty situations, while the discharge protection prevents cell damage. It also provides full system compatibility with 60+ M18 cordless solutions. Upgrade to the M18 REDLITHIUM XC 5.0 Battery Pack to instantly increase the run-time and durability of your M18 cordless tools.